The Princess Bounce House is the perfect inflatable for the little girl who wants to be a princess. What better way to celebrate a birthday or other event than in a beautiful and adventuresome pink castle. 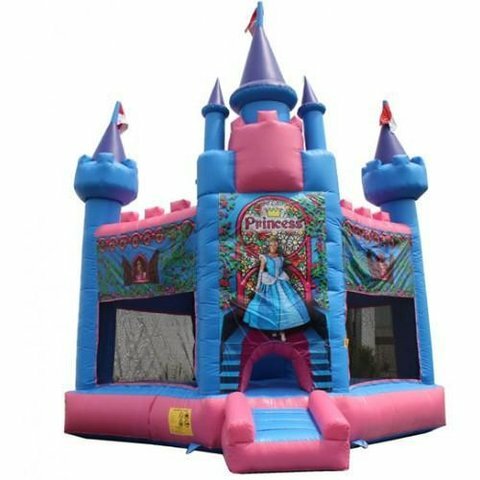 This high quality commercial inflatable castle bounce house is designed in pink, blue, and purple with flags on each spire. This unit features an unique diamond-design to give it the appearance of an actual castle. It is the perfect bounce house for the princess to rule her kingdom. Lining the outside of this castle are vivid images of flowers and princesses. Your customers will love the excitement that this design brings to party celebrations. A Princess Bounce House allows the imagination to run wild for hours of bouncing playtime enjoyment.